There are currently 90,524 users on this website. I'm new with no clue. from estate. came in plastic cash and appears to me to be of high quality. 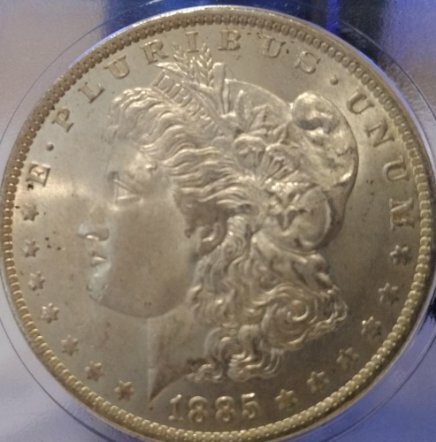 where is the best place to sell such a coin? should I get it graded and will that make a difference? Please supply a photo of the reverse. This is an extremely common date & mint mark. Unless it is at least MS 65 it isn't worth TPG. Sold raw, as is, probably only has a value in the $25-30 range. If the reverse is as nice as the obverse, then I would call it an MS 64 as this coin has a soft strike. This can be seen over the ear where vary little hair detail is present in the strike. "The Necessity of Procuring Good Intelligence is Apparent & Need not be Further Urged"
learning how to use. posted photos. this site is extremely valuable and your post was very helpful. thx. Can you show us the reverse, possibly in a larger pic?